Packing clothes and electronics is just the beginning when preparing a son or daughter for college. When students go to college they are, in reality, moving their daily lives. In addition to basic needs, families can help their children make a smooth transition with some early financial and health-care planning. Students and their families need to prepare for many routine expenses that are not considered qualified expenses by a 529 college savings plan. There are different ways parents and children can manage these funds. 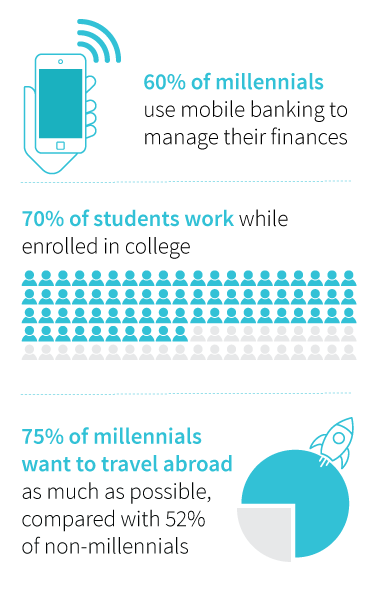 A 2015 report found 60% of millennials use mobile banking services to manage their finances. If a student does not already have a checking account, starting college is a good time to set one up. A parent could remain a co-owner of the account until the child reaches age 18, to monitor the account and set limits on daily activity. When setting up an account, consider a bank that is easily accessible to the school. Some banks offer student discounts and benefits. Overdraft protection may not be necessary, which can save on fees. Review the differences and advantages between securing a debit card or a credit card. Add a savings account as an opportunity to guide students into regular saving. Link the accounts for fund transfers. Students may also want to apply for a retail credit card to start building credit. However, a 2009 law prohibits companies from offering a credit card to anyone under 21 unless they have a co-signer or can demonstrate their ability to pay their bill. Students won’t always be on campus and will need funds for traveling home, meals outside of the dining hall, private taxi service, shopping, and basic necessities. Parents and their children will want to coordinate the best way to transfer funds and offer financial support. Money could be transferred through linked bank accounts. Another method is the Venmo app, which allows the transfer of money via a text message and doesn’t require the use of cash or cards. Transportation is another issue that can be addressed in several ways. Students may not need a car on campus. But if they do, they need to research the college rules and financial obligations. Parents need to decide whether their child would be covered by their insurance or on a separate plan. Generally, students can stay on their parents’ policy if they do not own the car, they still live with their parents, or their primary residence is their parents’ home. Depending on the location of the school, public transportation may be the primary choice. A Zipcar membership may be sufficient if students only need a car part-time. Most colleges offer a school health plan. It’s important to compare the benefits with private health insurance. If the student is studying or traveling outside of the United States, parents may want to make sure their child is covered by their health plan. Or they may choose to waive the college health plan and save that cost from the tuition bill. Completing a health-care proxy before a child leaves for school is also important, in order for parents to access their child’s medical records. Many students work while going to college. A Georgetown University study found 70% of students work while enrolled in college. Some colleges offer a work-study program where students can earn money at a pre-screened, partnering company. Students and parents will want to understand the paperwork needed to apply for these jobs, such as tax forms and payment information. Working can provide students with spending money as well as references and an opportunity to start building a resume. A recent study found 75% of millennials want to travel abroad as much as possible, compared with 52% of non-millennials. For students with the desire to travel, families may want to help set up accounts at banks with overseas affiliations, plan a budget for the trip, and investigate insurance needs. Understanding exchange rates is an important part of the financial planning. If the student plans to take a major credit card abroad, they should let their credit card company know that they will be traveling so using the card will not trigger identity-theft alerts. Many news sources publish checklists focusing solely on travel abroad. Depending on the college and length of the trip, a travel-abroad program may mean that the parent will not have to pay full tuition for the semester, but rather only the tuition for the travel program. There could be significant savings. Students may also find that a semester on campus may be more expensive than a semester abroad program. Many students want to travel for fun. Planning several months in advance can help them find the best deal. Sometimes school-sponsored programs may be less expensive than independent travel. An all-inclusive hotel can save on costs. Preparing for college may also be an opportune time to meet with the family’s financial advisor. Creating an expense budget will likely stimulate a lot of questions, such as how does working affect financial aid eligibility, why they cannot use a 529 plan to buy a used car, or when is a computer considered a qualified expense. An advisor can provide answers and help students understand why their parents may need to set new limits on spending halfway through the year.